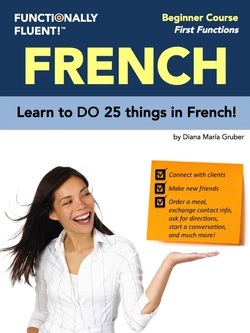 Learn to do things in another language! ​The Functionally Fluent! series is currently available in Spanish - purchase your Spanish course here! Other-language materials are currently in production, and will be ready for sale soon. Indicate Interest in a Functionally Fluent Foreign Language Course today! Yes! I'm interested in becoming Functionally Fluent! in French, and in purchasing the French learning system. Please keep me posted as this product becomes available. Yes! I'm interested in becoming Functionally Fluent! in Italian, and in purchasing the Italian learning system. Please keep me posted as this product becomes available. Yes! I'm interested in becoming Functionally Fluent! in Portuguese, and in purchasing the Portuguese learning system. Please keep me posted as this product becomes available. Yes! I'm interested in becoming Functionally Fluent! in German, and in purchasing the German learning system. Please keep me posted as this product becomes available. Sí, ¡me gustaría aprender inglés con el sistema de aprendizaje de Functionally Fluent! Por favor manténganme informado/a sobre la disponibilidad de este producto. Yes! I'm interested in becoming Functionally Fluent! in another language, and in purchasing a learning system for that language - please specify which. Please keep me posted as this product becomes available.